Let’s kick things off by addressing the elephant in the room: Panerai debuted a 38mm diving watch at SIHH this year. The most diminutive release by the brand to date, the Luminor Due 3 Days is bound to boost sales in the entry-level bracket with its approachable proportions and new in-house calibre. It’s an important strategic announcement for the Neuchâtel manufacture — particularly given their tendency to design almost exclusively in formats exceeding 40mm — though it lacks certain dramatic weight commonly expected at the Salon. Fortunately, for those Paneristi who’ve gone beyond acquiring their first Luminor Base Logo, Panerai had another announcement to make — the release of an all-new customisable model in the L’Astronomo family. The original L’Astronomo was released over a decade ago and is finally being released in a made-to-order edition for 2018. First released in 2010, the original L’Astronomo watch was made to commemorate the 400th anniversary of Galileo’s celestial observations (made possible by the invention of the telescope). It was a powerful watch that brought together a rather large number of complications including a tourbillon, calendar and sunrise/sunset display. This year, these existing specs are getting an addition in the form of a moonphase: the first time ever that Panerai has offered such a complication. At a glance, the new L’Astronomo Luminor 1950 Tourbillon Moon Phases Equation of Time GMT — or PAM 920, as more people are sure to call it — is a beastly 50mm statement watch; and given its made-to-order pedigree (i.e. featuring indicators that can be manufactured to display specific coordinates) it’s likely to attract Panerai loyalists looking to distinguish themselves from the brand’s burgeoning fanbase. The L’Astronomo takes a slightly esoteric approach to dial execution by hiding its moon phase on the caseback. The moon phase is composed of two superimposed discs, visible from the caseback, which work by rotating over one another. The outer disc features 24-hour markers against an illustrated backdrop of a sunlit sky (during daylight hours) which gradually transitions into a starry night (nighttime hours). Meanwhile, the inner disc features a cutout which hides the watch’s titular moonphase: rotating in conjunction with the exact duration of a single lunar cycle — approximately 12 hours and 29 days. A less visible but equally interesting feature that Panerai have incorporated (dial side) is the polarised date system. Part of a sub-disc at the 3 o’clock position (which incidentally displays the months of December, September and June) it is made of borosilicate glass which renders the numerals invisible to the naked eye. The only numbers visible are those aligned in the date window, ensuring that the skeleton movement of the L’Astronomo possesses high visibility at all times. 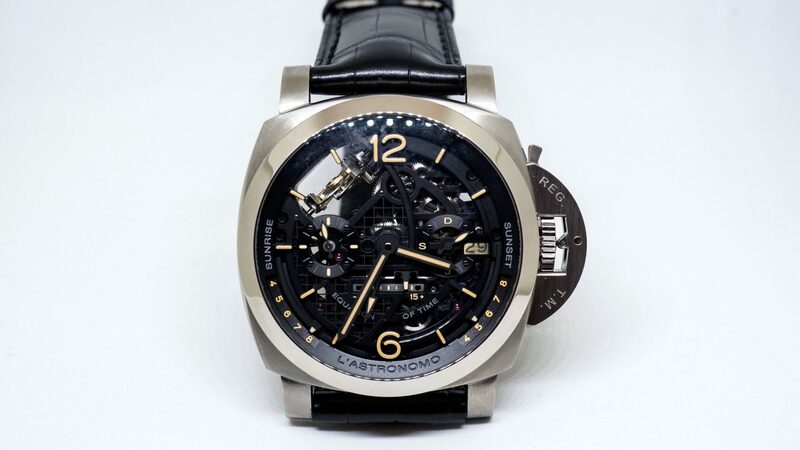 The L’Astronomo is powered by Panerai’s automatic calibre P.2005/GLS. 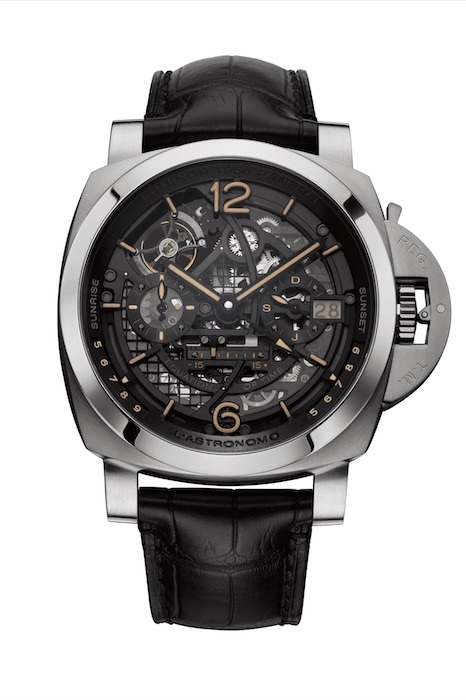 This new movement features numerous functions that were present in the original L’Astronomo model; whilst also incorporating an unconventional tourbillon design. 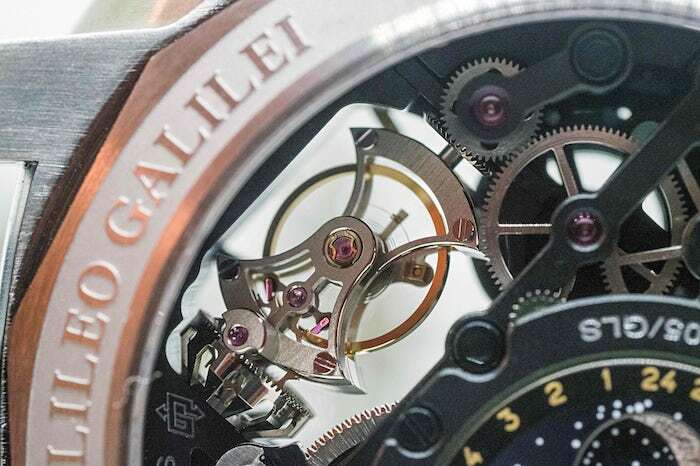 A signature of Panerai GLS calibres, the tourbillon cage rotates perpendicular to the dial, unlike many watches that utilise a parallel rotational axis. 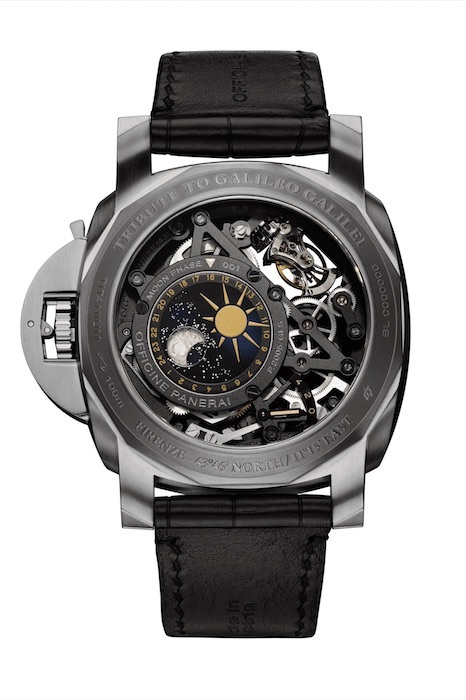 The L’Astronomo Luminor 1950 Tourbillon Moon Phases Equation of Time GMT is available from prices starting at US$230,000. Production time is approximately one year from date of ordering. To find out more, visit Panerai.